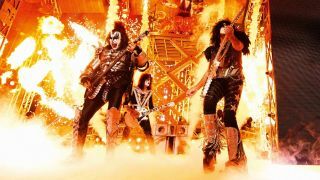 A Kiss concert film is being screened at cinemas around the world for one night only this May. Kiss Rocks Vegas will be shown in select cinemas on May 25, with some venues playing the broadcast with high quality Dolby Atmos audio. The concert was recorded on the band’s November 2014 residency at the Hard Rock Hotel in Las Vegas. Tickets and full listing details will be made available in due course via the official website.